April 03, 2018 "Information Clearing House" - The Russian government sent fourteen specific questions to the British government and thirteen questions to the OPCW. There seems to be some French involvement in the investigation of the alleged nerve agent and Russia ask why that is the case. 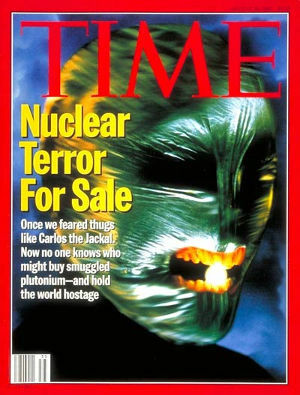 SPIEGEL Cover May 10 1995 "The BND's Nuke Hustle""How German secret agents invented the plutonium hazard"
It turned out that the plutonium was not from Russia but had been planted by the German equivalent of the MI6, the Bundesnachrichtendienst (BND). Leaks and counter-leaks created a convoluted story to hide the truth behind it. A parliamentarian commission investigated the case but the Kohl government eventually shut it down without any political consequences. 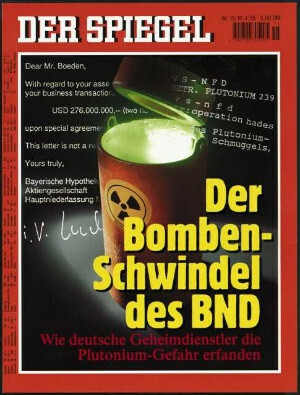 Shortly thereafter the deeply involved BND head, Bernd Schmidbauer, was sent into retirement. The Russian depicting of the 'Novichok' case as a staged 'provocation' has a historic antetype and, quite likely in my view, significant merit. It took nine month for the 'Hades' story to fall apart. The 'Novichok' fairy-tale may now see an earlier end. Watch the gap Mrs. May. Watch the gap.